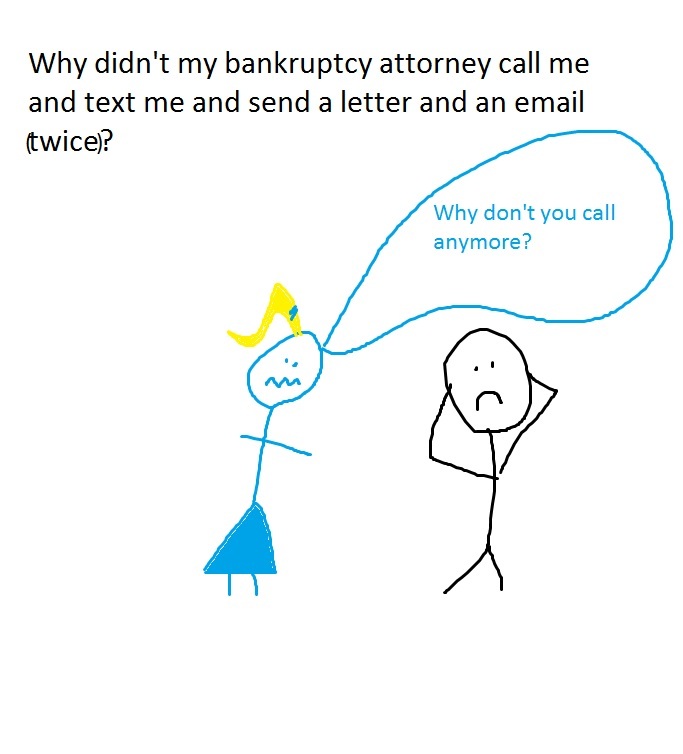 Why didn’t my bankruptcy attorney call me and text me and send a letter and an email (twice)? Today I spoke with an angry client whose case was dismissed because he ignored our conversation when we filed the case, ignored my follow-up email, ignored a letter from the court, and ignored my letter forwarding that court letter. He was frustrated because I didn’t go through the reminder process again right before his case was dismissed. In my practice, my clients have my personal email, my cell number, and I respond to text messages virtually any time. That being said, after I tell them what I need or what the trustee is asking for, I expect them to respond. We are all adults, and I figure that if someone gets a “to do list” from me, that they’re going to follow through or ask me for clarification. I know that my clients call the next morning if I don’t respond to their email. 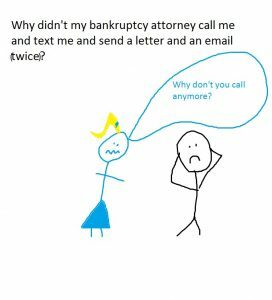 So my advice to other potential clients of me or anyone else is simple: respond to your attorney’s letters/email/voicemail/texts. If something doesn’t make sense, ask for an explanation. Sometimes I screw up, and when I do, I’ll own it and even eat the legal fees. And I guarantee that I’ll tell the client what is going on. This entry was posted in Utah Bankruptcy on September 2, 2016 by robertspaynelaw.